Lateral view of the hip with the femur in flexed position. 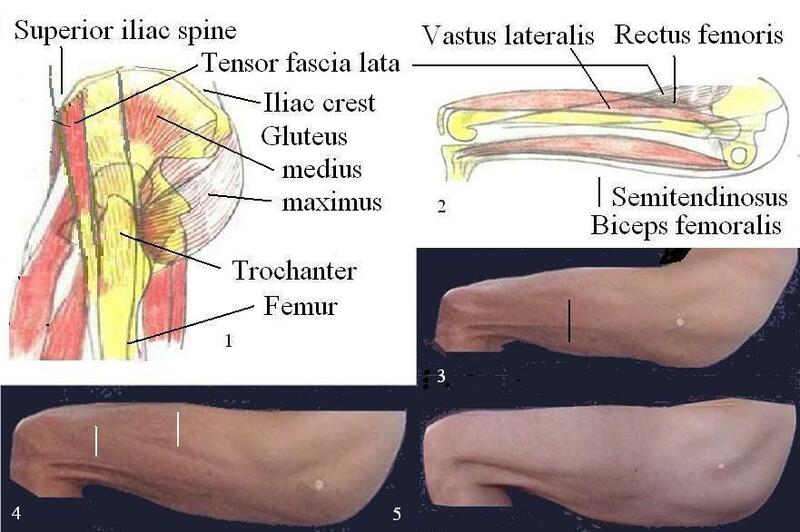 Lifting of the femur removes the trochanter from below the tensor fasciae lata allowing its location (white marks in figures 3,4,5). The very variable appearance of the region in-between trochanter and rectus femoris is due in part to the eventual "bulky" structure of the tensor fascia lata and the eventually different muscles involved in the process of lifting the leg. Placing the foot on a chair and keep the leg passively in place would produce a rather bland image of muscular display. Fig. 3: Vastus lateralis (above black mark). Fig. 4: Indentations produced by the fascia lata onto the vastus lateralis (below white mark).